Enlarge / Sulfurous gases leak from a fumarole near Naples, Italy. Waking up is, in the sage words of Sum 41, hard to do. The experience leaves many of us temporarily irritable, such that many of us choose to leave certain loved ones alone until they’ve had time to completely reach a conscious state. Volcanoes are not entirely dissimilar. After lying dormant for decades or more, they can wake up violently—and the best case scenario for people in the vicinity is to get out of their way. But while the alarm clock can give you a good idea of when a human may wake up, a volcano's wake up schedule remains frustratingly and frighteningly cryptic. Campi Flegrei is a caldera—a collapsed volcanic crater—near Naples, Italy that formed 39,000 years ago in the biggest eruption in Europe’s last 200,000 years. It now sports fields of gaseous vents indicating that the volcano is still alive below the surface. The volcano has been closely monitored—for good reason—and its activity in recent decades has given geologists a lot to study. In the 1950s, the surface above the caldera began swelling, rising by a total of more than 3 meters since. In 1983 and 1984, its pace quickened, and a flurry of shallow earthquakes and other activity made for a worrying change. That was the end of it, though, and Campi Flegrei slumbered quietly until 2005. Since then, the surface has risen another 0.4 meters, the pace accelerating slowly. The guts of a volcano are complicated, and the signs of moving magma and superheated water are difficult to interpret. Eruptions are preceded by flurries of activity, but there are also false alarms. A group of researchers from Italy’s National Institute of Geophysics and Volcanology led by Giovanni Chiodini focused on a poorly understood portion of this process—the transfer of heat from magma to the overlying rock carried by water vapor released from the magma. As magma rises closer to the surface, it encounters lower pressures, which makes it easier for volatile gases like CO2 and water vapor to escape. Water vapor is quite effective at dumping its heat wherever it cools and condenses. So, while the magma heats the rock it's touching, fluids also carry that heat upwards. As the surrounding rock heats up, its strength is reduced, enabling deformation like we've been seeing—as well as a failure that can help uncork an eruption. 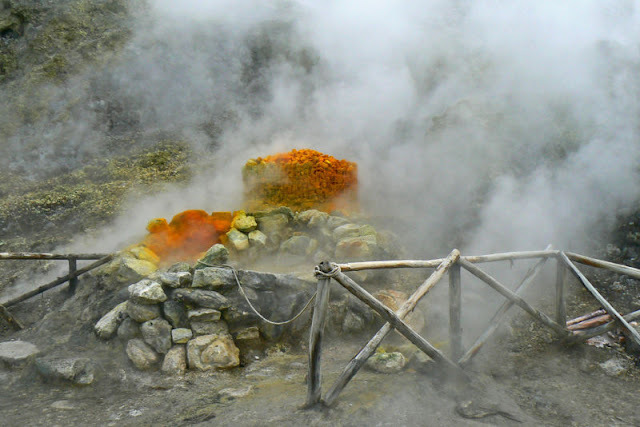 The researchers started with a computer model of the gases released from rising, decompressing magma. As the pressure is released, water vapor makes up an even larger share of the escaping gas, and there’s a sort of critical point where that escape accelerates. The researchers believe that this is a key step in the run-up to an eruption at volcanoes like Campi Flegrei. They then looked at what happens when magma batches are injected into a volcano’s plumbing. Based on the match between this model and chemical measurements at the vents around Campi Flegrei, they identified 14 instances of magma injections since 1983. The team then went back to the first model and simulated that timeline of injections. The results showed that the water vapor heating has been accelerating, increasing the temperature of the rock above the magma by 60 degrees Celsius. Most importantly, that model showed the kind of behavior that matches the lead-up to the critical pressure point where this heating process accelerates rapidly. That could explain Campi Flegrei’s growing unrest since 2005, they conclude. This conclusion comes with a strong set of caveats, though—as it should, given that over half a million people live near this volcano. Even if the researchers are right, they would not be able to predict whether it would take Campi Flegrei a few years to erupt, a few decades, or more. Models can’t simulate the network of fractures and spaces that make up the volcano’s plumbing system. There are additional processes that can influence what the volcano does. The cooling, off-gassing magma can thicken enough to clog up the pipes, for example, slowing things down. The quiet period between 1984 and 2005 serves as a good reminder of the complexity of this process. If Campi Flegrei does stir from its slumber, the eruption won’t necessarily be as violent as the one that marked its birth. Its history also includes a number of smaller eruptions. The most recent eruption, in 1538, formed a new cinder cone over 100 meters tall—which is impressive, but not the sort of event that would endanger many people. 0 Response to "Naples’ sleeping volcano might be waking up"